By special request, we’ll have a 3-part oil/acrylic workshop to paint this beautiful winter scene. 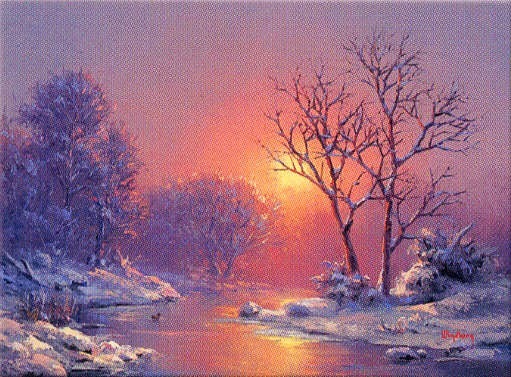 Follow along, step by step, as we study color theory and paint “A Glow at Sunrise”. In this workshop you’ll learn how to use a limited palette, how to blend the soft colors of sunrise, how to mix the colors of snow and how to paint water reflections. Workshop will be held in 3 parts, starting this Wednesday, December 4, 2013 from 1 PM to 4 PM and again the following 2 Wednesdays, (Dec. 11 & 18). This is an Intermediate class (or Advanced Beginner). Instructor is Maureen Butler. Workshop fee is $22 and includes a discount coupon for canvas size of your choice. Bring your paints and brushes. This landscape involves a lot of blending, so oils are recommended, however, we’ll also demonstrate some acrylic blending tips if that is your medium of choice.